Meteorologist Mike Nicco has your local AccuWeather forecast. We begin today partly cloudy and milder with temperatures in the upper 40s to upper 50s. Watch out for dense fog near the Coast and Golden Gate Bridge. This fog spreads east into the Bay during the morning commute. 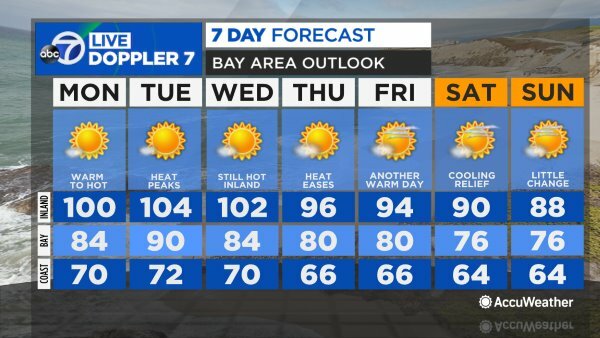 VIDEO: Meteorologist Mike Nicco has your Bay Area AccuWeather forecast. The fog returns to the Coast with high clouds becoming more dominate the rest of today. Highs retreat to the lower 60s at the Coast to middle 60s in San Francisco, lower to middle 70s for the Bay and upper 70s to lower 80s inland. A cold front increases the sea breeze and brings thicker clouds with a chance for drizzle tonight. Lows dip into the lower to middle 50s. Morning clouds and drizzle give way to a partly cloudy afternoon Saturday. The fastest and coolest breezes also take over with highs in the 50s and 60s. More sunshine and a slower breeze allows temperatures to rebound into the 60s and 70s Sunday.